In my earlier post, I mentioned I made a creamy black bean soup along with those vibrant corn muffins. Here is the recipe. The creamy part is due to corn tortillas that gets cooked right in the soup along with the vegetables. As the soup boils, the tortilla melts into the broth, leaving you with velvety soup. I have used an Ancho chilli (a dried poblano), which is mildly hot. You can also use any other Mexican chilli you have on hand, for a different flavour. If you don’t have any of these chilli peppers, use regular red chilli powder. Since I served ‘em corn muffins, I didn’t add corn kernels. But that would be a nice addition if the soup is served on its own. 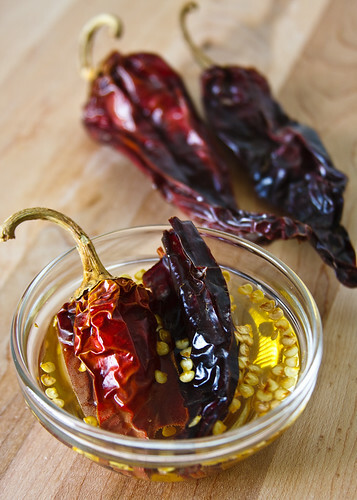 Soak ancho chili in hot water for 20 minutes. Once it is soft, puree with the soaking water until smooth. Reserve. In a soup pot, heat oil, roast cumin seeds. Add onion, carrot, celery, garlic, and sauté for a couple of minutes. 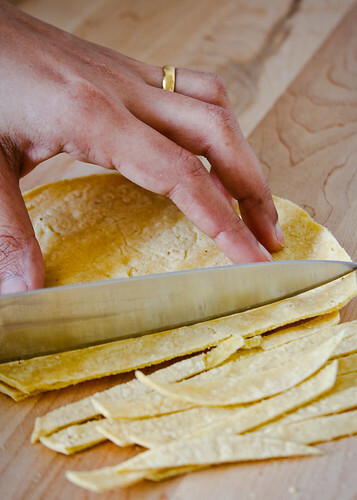 Add chopped tomato, corn tortilla strips, pureed Ancho chili, stock, and salt and bring to a brisk boil. Add the cooked black beans, red chilli powder and 1 cup of water. Cover and simmer for 20-30 minutes. If you have a stick blender, partially puree the soup right in the soup pot, so that it remains chunky. Or else, in a blender, puree 1 cup of cooled soup, and add back to the soup pot. This gives the soup its creamy texture. Of course, if you want it chunky all the way, ignore this step. Check for seasoning, and serve hot with lime wedges, tortilla strips and corn muffins. I hope Vaishali will enjoy this creamy, but vegan delight. Sending this off to her event It’s a Vegan World: Mexican. The soup looks so yummy and delicous! Lovely pic. Wow,looks delicious,spicy and as all your dishes very comforting .Love the entry. Wow this soup looks so so yummy delcious. I am sure vaishali will love this. Suganya, my tastebuds are tingling after reading this incredible recipe. Love the fire in this soup, and love that the creaminess comes from the tortillas. This is a must-try. Thanks! Ohh boy...what a soup!! and am always fascinated with ur pics..best of the lot I must say ..
That soup looks awesome.. creamy and delicious. Great entry. Gorgeous as usual. Great idea to cook the tortillas in the soup! Very good recipe. Interesting blog with fantastic pictures. Looking so delicous, love spicy soups. OH man that looks so good! 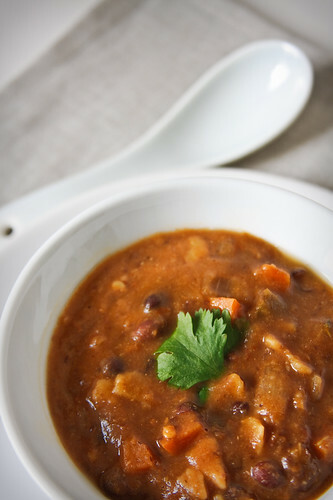 I'm a sucker for a good black bean soup! that soup is soo yummylicious!! love the feel of tortilla in the soup! yummm..
And thanks for visiting and the compliments :) A bamboo steamer is tough to clean if you leave it for later. We quickly wiped it with a wet cloth/tissue, and let it dry. Am sure I will like this soup too. Looks delicious. The picture of the Anchos are "hot". I had this soup when I recently visited US in a mexican restaurant and I immediately got hooked to it. Having the recipe is something great and sure I will make. first time here..very good blog..awesome photography..i am very much inspired by your photography suganya !! Yay, I can finally use up the Ancho chilis sitting in my pantry. The soup looks delicious. Drooling....lovely click and combo soup.. This is one of my all time favorite comfort foods. And pairing it with one of your spicy corn muffins would make the perfect meal. I love tortillas in soup. Looks too good. Love the pictures and blog...Nice presentation too. HOLY COW. BLACK BEAN TORTILLA SOUP!!! I just made this along with the spicy corn muffins. So delicious!! What a wonderful combination. Can't say enough good things about it, very simple to make, too! Oh I can't wait to try your recipe! It looks yummy.